– for Clinton after Texas and Ohio? FLUSH REPORT. 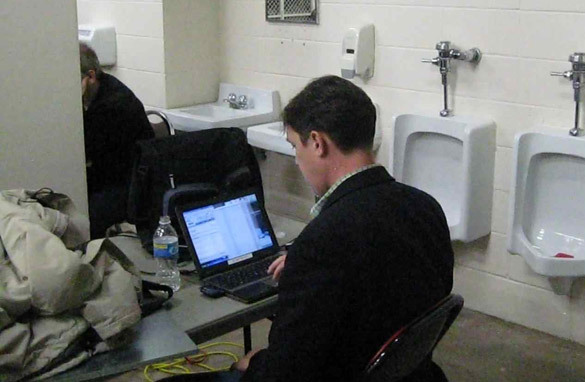 The scene of the Clinton press corps’ less-than-ideal filing center in the Berger Activity Center men’s locker room in Austin, Texas. WASHINGTON – Hillary Clinton, the prohibitive favorite in the Democratic presidential race just months ago, faces the possible end of her White House road on Tuesday in Ohio and Texas. The New York senator battled on Monday to save her campaign with victories in the two showdowns, which would halt rival Barack Obama’s streak of 11 consecutive wins in their hard-fought duel to be the Democratic nominee in November’s presidential election. Voting ends in Ohio at 7:30 p.m. EST (0030 GMT on Wednesday) and all voting in Texas will be over by 9 p.m. EST (0200 GMT on Wednesday). Clinton’s husband, former President Bill Clinton, has said she needs to win both states to continue her campaign, a view shared by many analysts. Polls show tight races in both. Even a split decision in the two states would leave her with a steep climb to overtake Obama’s lead of roughly 150 pledged convention delegates who select the nominee, and increase the pressure on her to quit. Obama endorsed the idea Clinton needs wins in both states, which have a combined 334 delegates at stake, to prolong the Democratic race. Republican front-runner John McCain, an Arizona senator, also can come close to clinching the nomination on Tuesday with expected wins over his last remaining major challenger, former Arkansas Gov. Mike Huckabee. McCain told reporters in Phoenix he was “guardedly confident” he could reach the 1,191 delegates needed to clinch the Republican nomination on Tuesday and move on to a general election campaign. “I still respect Governor Huckabee’s right to remain in this race for as long as he feels necessary to do so,” he said. Clinton’s advisers have worked overtime to roll back expectations and turn up pressure on Obama in Tuesday’s contests in the two big states and Vermont and Rhode Island. But they would not speculate on what Clinton would do in the case of a split decision. “We are very optimistic about our chance of success in Ohio and Texas. If the outcome is different we can talk about it then,” said Clinton spokesman Howard Wolfson. Like her husband, who nicknamed himself “The Comeback Kid” for his improbable rise to the White House in 1992, Hillary Clinton has dodged predictions of doom before. In January, Obama appeared ready to deal her a knockout blow in New Hampshire after his big win in Iowa, but she defied polls and swept to victory. A few weeks later, her landslide loss in South Carolina and a string of high-profile endorsements gave Obama momentum heading into Super Tuesday contests around the country, but she battled him to a draw and won most of the biggest prizes of the night in California, New York and New Jersey. “This has been a roller coaster race, and every time people try to foreclose it the voters come back and say ‘just wait a minute here, we want to have our say,” Clinton strategist Mark Penn told reporters. “Let’s see what the voters say, let’s take a look at what the situation looks like on Wednesday, and I think it will be pretty clear,” he said. Clinton hunted for votes in Ohio and Texas on Monday. She began her day with a predawn visit to a Chrysler assembly plant in Toledo, Ohio, a city that has struggled with the losses of manufacturing jobs and poverty. Clinton planned to buy cable time in the evening for a televised town hall meeting in Texas, while Obama planned a two-minute ad on evening newscasts in Ohio that it billed as his closing argument to voters. Under Democratic rules allowing the losers in each state to win a proportional amount of delegates, Clinton will be unable to dramatically close the gap on Obama unless she scores big wins in Ohio and Texas that appear to be beyond her grasp. Obama campaign manager David Plouffe released a memo questioning Clinton’s options if she does not make major strides in catching up to Obama in pledged delegates. Dude, Clinton won Rhode Island, Ohio and Texas, a perfect tripleta. The fight is on.